Crowds are gathering at a 60,000-seat stadium in Zimbabwe’s capital, Harare, to witness the swearing-in of Emmerson Mnangagwa as the country’s president. Mr Mnangagwa, who had fled the country, returned from exile on Wednesday. The opposition is urging Mr Mnangagwa, who has been part of the ruling elite, to end the “culture of corruption”. How will the inauguration unfold? The ceremony will be at the National Sports Stadium and organisers have called on Zimbabweans to come and witness a “historic day”. After Mr Mnangagwa and his wife Mai enter and the national anthem is played, Bishop Mutendi will lead the stadium in prayer. Mr Mnangagwa will take his oath of office at about 11:30 local time (09:30 GMT), before a flypast and a gun salute. The new president will speak at about noon local time. Will Mr Mugabe be there? 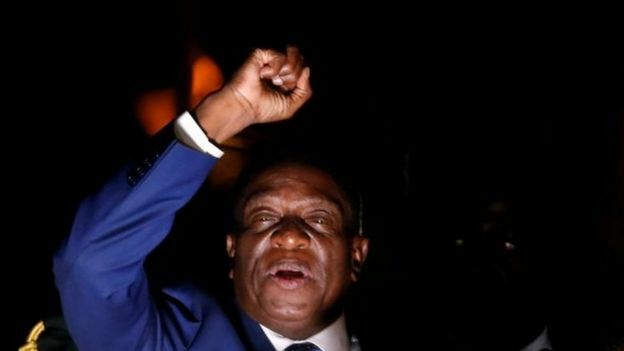 He is not expected to attend Mr Mnangagwa’s inauguration, the BBC’s Andrew Harding reports. The official explanation for the former president’s absence is that the 93-year-old needs to rest. But the fact he is not attending is a stark reminder that this is no ordinary transition, our correspondent adds, that despite his official resignation he was forced out by the military. The news on Tuesday that 93-year-old Mr Mugabe was stepping down sparked wild celebrations across the country. 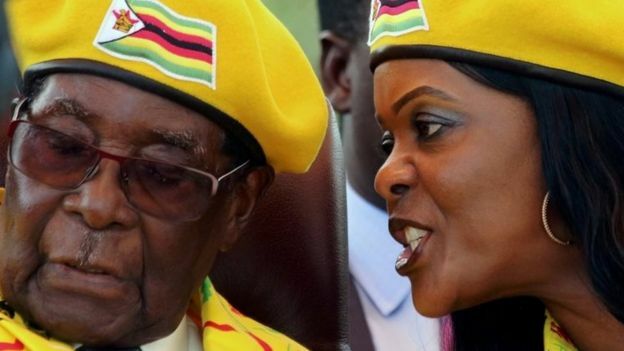 Neither Mr Mugabe nor his wife Grace have been seen in public since Sunday, and their whereabouts are unknown. Ahead of the swearing-in, Mr Mnangagwa urged Zimbabweans to “remain patient and peaceful and desist from any form of vengeful retribution”. He fled to South Africa two weeks ago – only to return home on Wednesday to a hero’s welcome. Mr Mnangagwa pledged to create jobs in a country where some estimates say 90% of people are unemployed. “We want to grow our economy, we want peace, we want jobs, jobs, jobs,” he told cheering crowds in Harare. Zimbabwe’s main industrial index has slumped by 40% since last week’s military intervention. The stock market has shed $6bn (£4.5bn) in a week. On Thursday, Zimbabwe’s main opposition MDC party called for deep-rooted political reform to dismantle the repressive apparatus that sustained Mr Mugabe’s regime. “As MDC, we are saying, after so many years of Zanu-PF misrule, the first thing that needs to be transformed is the culture. The culture of violence, the culture of corruption. We need to change that culture,” MDC leader Morgan Tsvangirai said.